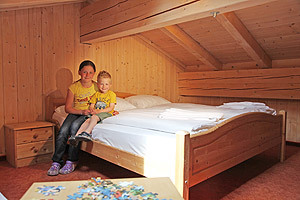 Bedroom with king-size bed, second bedroom in the attic - especially for kids, "the Heidi-Lodge", living room with daybed, fully-equipped kitchen, dishwasher, lounge area, balcony, satellite TV, wireless Lan in the breakfast room, bathroom with shower, WC, bidet and hairdryer. Especially the youngest family members would be exalted about their own, elevated "Alpine Lodge", where to nestle down in the big beds and feel like Heidi & Peter on the mountain pasture. And after a restorative sleep our healthy and tasty breakfast with products from our own farm is the best start in a new day!